Computer Concepts: Illustrated Introductory (Illustrated (Course Technology)) 9 Edition Computer Concepts Illustrated is designed to help students learn and retain the most relevant and essential information about computers and technology in today's digital world! 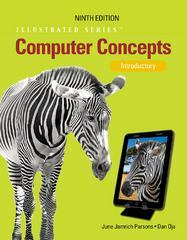 This edition has been revised to cover the latest important computing trends and skills, but maintains the pedagogical and streamlined design elements that instructors and students know and love about the Illustrated Series. New for this edition, make the most of Computer Concepts Illustrated with the all-in-one CourseMate digital solution complete with a media-rich ebook, interactive quizzes and activities, and the Engagement Tracker for hassle-free, automatic grading!